Dr Jan Lauko is a graduate of the Comenius University in Bratislava with a Masters Degree in Organic chemistry. 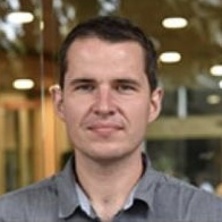 In 2007 he started a PhD in the group of Prof Alan Rowan in Nijmegen, the Netherlands where he was focusing on the design of extended-conjugation supramolecular graphene constructs using click chemistry and macrocyclic sensor probes for mechanistic studies of epoxidation reactions. In 2012 he joined a Dutch start-up company NovioSense BV as CTO where he developed the coating and sensor elements as well as the integration of electronics and medical device design for the NovioSense sensor platform. At the end of 2016 he joined the newly formed group of Prof. Rowan at the Australian Institute for Bioengineering and Nanotechnology as a research fellow and group manager. Currently, he is focused on the study of synthetic biomimetic extracellular matrices, for use in cell growth and wound healing. In his previous appointment, Jan was developing electrochemical sensors, where specific enzymes embedded in polysaccharide coatings were able to detect trace amounts of analyte such as glucose or lactate and translate these into electrochemical signal. These were then utilised as the core technology of a non-invasive glucose sensor, in direct collaboration with industrial and clinical partners. At this moment this technology is in the clinical stage of development. Within AIBN, Jan is studying synthetic biomimetic extracellular matrices, for use in cell growth and wound healing. To enable the study of the influence of external forces on cellular development, Jan has designed, procured and constructed the so-called confocal-rheometer. This state-of-the-art equipment enables to directly visualise the processes in and responses of a material when external shear is applied. How does melanoma sense the tumour environment?